NOREEN AND GER Thompson lost their daughter Kayla 27 weeks into their pregnancy. 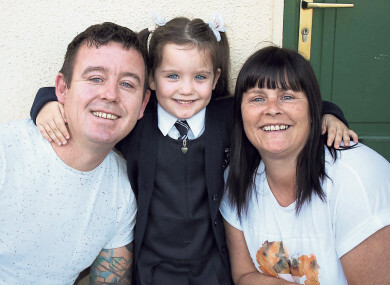 After suffering the trauma of an additional 11 miscarriages they gave birth to Ellianna, who was born premature, in May 2012 at University Maternity Hospital Limerick. Five years on, they describe the staff at the neonatal unit as “phenomenal”. “I could easily say some our great rugby players like Paul O’Connell and Brian O’Driscoll are my heroes, and they are, but the nurses and doctors in the neonatal unit are my superheroes. They are looking after very small babies who are struggling to stay alive. They are the greatest in the world. Ger, who has since raised over €40,000 for premature baby services in Ireland and the UK, plans to raise a further €10,000 for Crumlin Children’s Hospital by running the New York City Marathon in November. He is one of a number of parents and family members who came together yesterday for a reunion “prem party” organised by local radio station Limerick’s Live 95FM. Between 600 and 700 premature and seriously ill babies out of the 5,000 delivered every year at University Maternity Hospital Limerick are treated at the hospital’s specialist neonatal unit. Limerick mother Amy Gribbin’s two-year old son Olly, spent over two months in the unit after his dramatic arrival at 27 weeks. Little Olly stopped breathing a number of times but staff were always on hand to bring him back from the brink, his mother said. “We spent 73 days in the neonatal unit. I had two girls at home and it was quite tough at the time but it was Olly who needed me then,” said Amy, who had been admitted to hospital after her waters broke at 21 weeks. We made it to 27 weeks, still three months early but it gave Olly a good chance. Then we had an emergency at the hospital…while I was having a shower I realised his umbilical chord was literally just coming out, just falling out. He could have died. Doctors performed an emergency C-section within minutes and rushed Olly from the delivery ward to the adjoining neonatal unit where he was “ventilated” and tube fed. Amy said: “It’s so frightening at the beginning. No one is able to tell you if he is going to survive or not, to be honest, and you’re just taking things hour by hour. You’re sitting beside the incubator all day and you’re kind of trying to understand this whole new world. Luckily for Olly, he was still in the unit when he suffered a number of “desaturations” where he would “literally stop breathing” and “turn blue”. She whisked him out of my arms and ran across the unit and revived him, she brought him back with oxygen. She literally saved his life. Eventually bringing Olly home was a “nervous” time for Amy and husband John. The newborn had to wear a monitor “that would alarm if he stopped breathing”. Despite the ordeal – and many hospital admissions since – to treat lung related conditions, Olly has survived because of the care and dedication of his doctors and nurses. Amy’s husband John, added: “The staff in the unit were brilliant. We didn’t know it even existed, it was only when Olly decided to arrive that we found out about it. Eleanor and Darren Martin’s two-year old triplets – Alana (3 lbs 3 oz), Brooke (2 lbs 11 oz), and Courtney (3 lbs) – have also come on steadily from attending the Limerick neonatal unit after their early arrival at 30 weeks. “They’ve been christened A, B, C,” Darren joked. “It’s been quite a tough road,” added Eleanor. Brooke had chronic lung disease, and has no hearing in one ear. It’s their chests which cause the most problems now as they’re getting older. We have constant hospital admissions, but they’re doing really well. The couple from Rhebogue have two other children, Naomi (9) and Danika (16). “Only for the help of the staff at the neonatal unit it would have been a lot harder to get where we are. They don’t get enough credit for what they do. They are outstanding,” she added. Yesterday’s event was held as part of a major fundraising drive to raise proceeds for the Limerick Neonatal Fund; The Children’s Ark Unit (UHL); and Cari which offers support to victims of child sexual abuse. To make a donation by phone, text “Donate” to 57911. Texts cost €2 plus a standard network charge. Email “'They are looking after very small babies struggling to stay alive. They are the greatest in the world'”. Feedback on “'They are looking after very small babies struggling to stay alive. They are the greatest in the world'”.